An ad for the 1925 Greta Nissen drama “The Wanderer” adorns a corner lot on Vineyard Haven’s Five Corners. 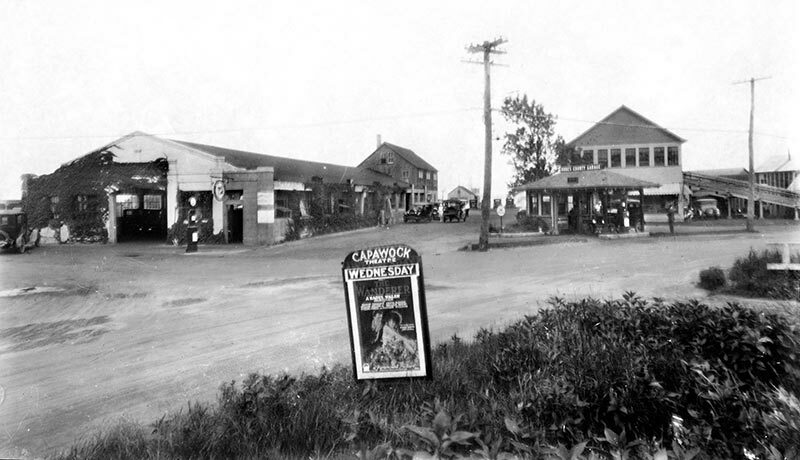 On the left is the Dukes County Garage, originally owned by LeGrand Lockwood Aldrich and later by William G. Manter. Under one metal roof, Manter had a parts department, an electrical department, a car-painting department, and a repair department (for both auto and marine engines), together with his contracting business and house-painting business. The building to the right was moved here in 1923 from its original location behind the stone bank. It had been built as a leather-novelty manufacturing factory for the short-lived Luxemoor Leather company, employing some 75 leather workers under the direction of owner William Barry Owen. The late Stan Lair recalled: “We used to play basketball in this building when it was behind the bank in the old location, and we had to shoot the ball over the supporting beams which ran across the building. It wasn’t an ideal place to play, but we had to play there because there was no gyms in those days. Also on each end, so the spectators wouldn’t get hurt, there was chicken wire put up there. I don’t know how many people got hurt on that chicken wire, with cut fingers and so forth. But, we used to play there, and enjoy it, and had good times.” In its new location, the Dukes County Garage used the building for offices and showrooms for Manter’s Buick and Chevrolet dealership. The second floor, originally a customs office, was leased to the Navy during World War II to house Navy personnel.